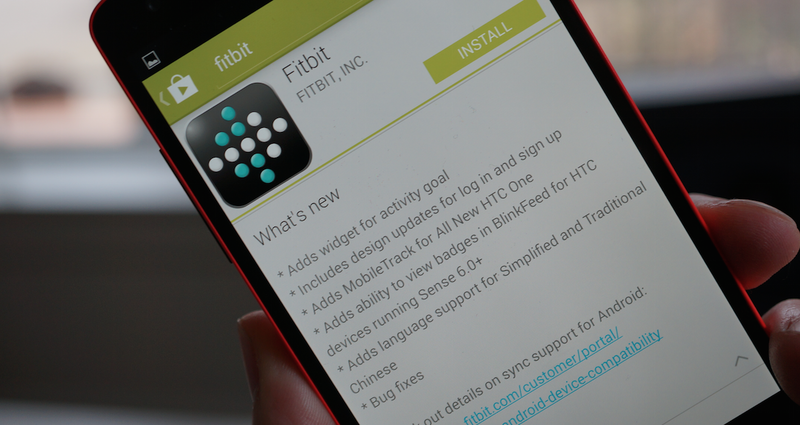 So, Fitbit rolled out an update today for its Android app. You now have a widget for your activity goal, design updates, and support for simplified and traditional Chinese. But that’s not the story here — looking through the update’s changelog, we also have “Adds MobileTrack for All New HTC One” and “Adds ability to view badges in BlinkFeed for HTC devices running Sense 6.0+.” What does this mean? Digging deeper into the MobileTrack feature first, the only other device to feature it currently is Apple’s iPhone 5s, because of its M7 motion coprocessor. Essentially, the iPhone app allows users with the M7 to monitor their activity and step count without having the app open, and in an accurate sense too. Users can use all of the basic functions of a Fitbit, but to access the full functionality of the app a hardware tracker is required to be purchased. What we can infer based on the fact that the One (2014) is going to feature this is that we’ll have some sort of activity tracker or pedometer present, which somehow hasn’t been leaked as of yet. In yesterday’s 14-minute German review, when translated, it is said that the device will feature a “pedometer” as well, so I wouldn’t be surprised to see HTC try their hand at the fitness industry when they unveil this phone tomorrow. The second thing mentioned is the ability to view badges in BlinkFeed for Sense 6.0 devices. I can only guess at the meaning of this as BlinkFeed showing new fitness goals and badges as you reach them. For those of you who got Verizon to sell you an All New One early, give the free app a shot and let us know how it goes down in the comments.